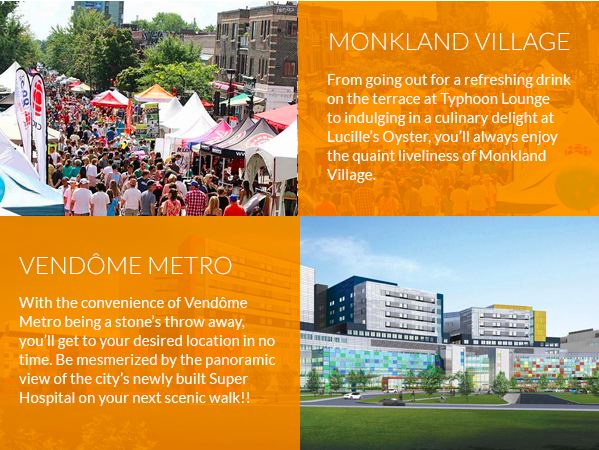 In close proximity to the super hospital, Monkland village, Vendome metro and Sherbrooke St., residents of the Oxford Condos never have to go far to experience the best that Montreal has to offer. This October, move into a 1 or 2 bedroom, loft-style condo with roof terrasses and indoor parking. Enjoy the neighbourhood activities such as the Monkland Festival, Flavours of the Monkland Village, Porchfest NDG and la semaine de Arts NDG. Take your family for dinner to the many diverse restaurants on Maisonneuve such as Restaurant Maru, Hwang-Kum, Amaranto, etc. Go for a ride along the numerous bike paths situated within the NDG area. Read your favourite book under a beautiful oak tree, hit some home runs in the baseball diamond and become acquainted to the friendly neighbourhood dogs in the bast greenery of NDG Park. Discover luxurious living at NDG’s Oxford Condos. Oxford Avenue & de Maisonneve, NDG, Quebec, H4A 2X7. Starting at $149,900. View the property here.